Following the success of our last event at our private floor in KU bar, we've decided to hold all our London Speed Dating events there, with a party at SHE Soho (just around the corner) afterwards. 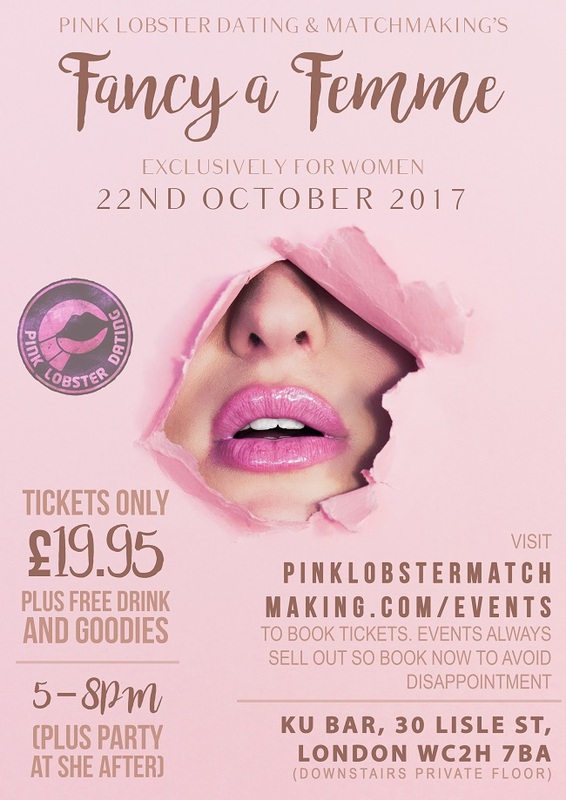 Join, Pink Lobster Dating & Matchmaking's hostesses, Emma, Juliette and Lauren for our celebrated “Fancy a Femme” Speed Dating, with a spooky vibe! Jump into the arms of another gorgeous femme and howl at the moon together for this special Halloween event. *Note you do not need to wear fancy dress just your gorgeous glad rags. This is your best chance to meet lots of femmes all at once, and who knows maybe even your lobster! There will be our well known speed dating with our special twist, games to put you at ease and lots of goodies with plenty of fun and all packed with ghostly glamour. The event starts at 5:00pm*-8pm plus Party at SHE Soho afterwards. *Please note earlier start time. Plus remember if you arrive late you may not be able to take part. Don't worry if you haven't got a PayPal account as you can purchase tickets as a guest. Emails will be sent to all ticket holders with further details nearer the time. Our last event SOLD OUT in record time so hurry if you don't want to miss out.